Common is defined as shared by or coming from more than one or belonging to whole community by the oxford dictionary. In the current context commons is a concept that underlines the idea of any common resource that is available to all but can be locally defined or specifically as “everybody belongs to category x”. Commons is an age old tradition mainly practiced in the East/south. Like the common village land, common water source etc. Similarly, commons is of two types primarily they are physical resource and human made resource. Human made resource can incorporate a body of information which is part of a culture and intellectual heritage. Commons is almost synonymous to public domain. So what is public domain then, public domain comprises of body of knowledge and innovation in relation to which no person or other legal entity can establish or maintain proprietary interests within a particular legal jurisdiction. The good and the bad side of public domain resource is, in general anyone may use or exploit the resource whether for commercial or non-commercial purposes. In general understanding, an item of work is not is public domain it may be result of a proprietary interest such as copyright, patent or other rights. So a resource in a public domain is very important to the commoner who is interested to use the resource in any form. The figure below attempts to explain the commons in a better way. Lets take a simple example, water is supposed to be a common resource so why do we pay for water to the government. Can we say that there won’t be a day when the government won’t charge us for clean air in this case of over pollution? Let’s hope that day does not come. Let’s analyze how intellectual property rights like copyright, patent, trademark, trade secret help growth reduction. The validity of a copyright for a book is life of author plus 70 years in current context. So after lets say about 140 years the resource comes back to the public domain. But core businessmen are trying to make the validity infinity minus 1 day which is bound to create problems. For further information please see www.copyright.gov on how copyright is certain to create troubles. On a technical base let’s try to define digital commons. Digital commons are those intellectual properties specifically in digital form and in the public domain. Digital commons tries to define in concrete terms that everyone is able to enjoy the digital revolution. It mainly advocates about the free and open source software, open source software and creative commons. 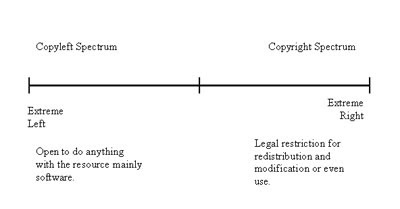 The figure below tries to clarify the commons concept with copyright and copyleft. An amazing fact about copyright © is that we don’t even have to mention copyright © Name and year to mark that we have the copyright of the creation or resource it is implicit by law. So if nothing is mentioned then it means copyright automatically. It is the restriction to copy or use the resource in any form. But commons is a transparent concept there by in the software world people like Richard Stallman and others advocated the concept of free software, free not as in cost but the freedom to use and modify. Free software is a software which is in the public domain for eternity. The free software foundation germinated licenses like GNU GPL (GNU Not Unix General Public License) and GNU FDL (GNU Not Unix Free Document License) that made it possible to use the software, distribute or redistribute it and make modifications to the existing software and as per condition sell it as well. Share Alike: The resource can be modified but should be given back in the same license it is take from the commons. There by rather than going towards the conventional copyright we must break the barrier by collaborative work that gives rise to the age old and proven concept of commons.